I recently had the opportunity to take PRI’s Impingement & Instability (I&I)course for the first time. The most important concept from this course, in my opinion, is that if patients can’t recognize, use, and integrate the sensory references need for upright, alternating, reciprocal function—the goal of any PRI program—then they will not be successful in their program. And neither will you. Definitely not something that excites most of us, regardless of whether you are a PT, strength and conditioning coach, trainer, or even an optometrist, dentist, podiatrist….the list could go on and include anyone working with this patient, whether to improve performance, decrease/prevent pain, or treat their orthostatic or anxiety issues. Impingement & Instability is the “bridge” course between the primary, “floor-up” PRI courses and the “top-down” secondary courses and the PRI Vision course. I&I concepts are the type of thinking that, in some regards, are the only thing I really know how to do when it comes to PRI. I am not a PT, nor do I have any formal educational background in human gait, movement, or physical performance. The minute a term like “anterior pelvic inlet” or “late left stance” comes out of Ron’s mouth, I’m a little lost. I’ve learned a lot over the past 5 years working with Ron and the other therapists here at the clinic, but this is why I keep taking and retaking courses! Anyone who knows me knows how much I HATE that feeling! But what I do clinically every day in PRI Vision with Ron is ALL about sensory awareness. So for the patients that need me, I know if they can’t consciously “find & feel” the floor under their left foot—in I&I the left calcaneus—nothing I have done so far will help them and we have to keep going until they can. There are, of course, other sensory references many patients need to increase or decrease. Some of them are discussed in I&I, some are not, and these vary based on the patient. Regardless of what these are, my job is to change the “top-down” brain’s sensory awareness so that the “bottom-up” activity from the primary courses can be effective. Impingement: appropriate contact not only between two points in the body, but also between the body and a needed sensory reference, such as the floor. Instability: the freedom to “let go” of a contact point, sensory or physical, so movement can take place. To obtain alternating, reciprocal function, you need proper impingement on one side paired with proper instability on the other, then the ability to reverse it—This is how “good gait” happens! Every patient I see in PRI Vision needs less impingement and less instability in certain areas, and more of each in other areas. Many have too much “impingement,” or reliance, on vision, and not enough on their left heel. We also frequently have to change multiple reference areas for the patient to make use of the new “instability” I am giving them in Vision. These changes can be the determining factor in the patient’s program success, and where I rely fully on Ron and the referring therapist to ensure this is accomplished when needed. If you haven’t taken I&I, you absolutely should! Ask some of the attendees that experienced the “right” PRI function for the first time during those two days. If you’ve taken I&I, then the next step is to take the Cervical Rotation and Postural-Visual Integration courses. These two courses will show you what to do when you have patients (or yourself!) that just can’t find and keep those sensory references from the I&I course. The head, neck, and ultimately the BRAIN are the “top-down” drivers that can negate, or reinforce, all of your and your patients’ “floor-up” hard work. Santa Cruz) Myokinematic Restoration. 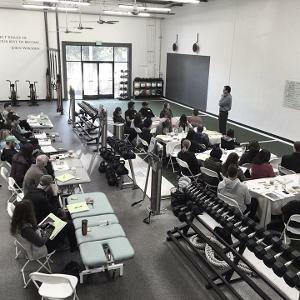 Had a fantastic weekend with a dynamic group of rehab, medical, performance and fitness professionals in the beautiful Paradigm Sport facility in Santa Cruz, California. Thank you Joey Wolfe for hosting such a great weekend and for making us all feel so welcome at Paradigm Sport. First Class all the way. And thank you to Julie Blandin and Caleb Chiu for their work as lab assistants and clinical PRI experts, having done such a great job answering questions and guiding attendees through proper testing and exercise technique during the lab portion of the course. As a group, we found ways to overcome the two key barriers to moving into the left hemisphere of human performance: (barrier #1) unexhaled air and (barrier #2) overactive polyarticular muscle chains. We did this with exhalation movement techniques that used the left hamstrings and left adductor and also the left abdominals (via left rib internal rotation) to help lateralize athletes to the left side. Securing left hip stability with "ligamentous muscle" then helped hold an athlete on the left side without requiring undue compensation. The California Coast is quickly catching PRI fever and we're more than grateful to support the process. I'm already looking forward to the next trip. This statue showed up after a great dinner at Hula's Island Grill. He made himself known after Julie, and Maureen and I discussed PRI Integration for Fitness and Movement all evening. We thought seeing this statue was a message from the universe that reminded us that single leg performance on the left leg was a big deal. Haha. We are excited to announce that Hannah Janssen joined the PRI staff full time earlier this month as Education Coordinator. Hannah is busy training with all the PRI office day to day activities, and also in learning the course material. To learn more about Hannah and how he became interested in PRI, click here! The weather was beautiful in Phoenix and the Seattle Mariners’ Spring Training complex was as well for Myokinematic Restoration last weekend! We delved into the challenging subject of human kinetics and the relationship to baseball as well as general athletic performance. The class was eager and excited and I received many notations that read “Wow! This is a real paradigm shift for me!” Thanks to all the participants in the sessions and a special thanks to Jimmy Southard, Head Minor League Athletic Training Coordinator of the Mariners organization for inviting PRI into his living room!!! It was the best!!! Congratulations to the PRT Class of 2015! 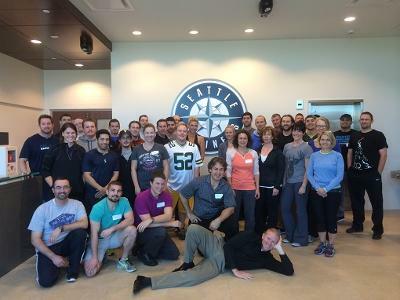 We are excited to announce and congratulate the Postural Restoration Trained (PRT) Class of 2015! PRT is the result of completing multiple advanced PRI courses, demonstrating a thorough understanding of the science through completion of the PRT application, and successfully participating in practical and analytical testing. Five individuals earned the designation of Postural Restoration Trained (PRT) under the direction of Ron Hruska, Michael Mullin and Jennifer Platt. The Postural Restoration Institute® established this credentialing process in 2011 as a way to recognize and identify individuals with advanced training, extraordinary interest and devotion to the science of postural adaptations, asymmetrical patterns and the influence of polyarticular chains of muscles on the human body as defined by the Postural Restoration Institute®. The PRT credential is available to Certified Athletic Trainers and Certified Strength and Conditioning Specialists who have completed the requirements. With the addition of this class, there are now 23 PRT professionals throughout the U.S.
PRT credentialed athletic trainers and strength and conditioning specialists offer a unique approach to physical medicine called Postural Restoration. This approach addresses underlying biomechanics which can often lead to symptoms of pain and dysfunction. All mechanical influences on the body that restrict movement and contribute to improper joint and muscle position are considered, examined, and assessed. Techniques are utilized to restore proper alignment of the body while proper respiratory dynamics are considered. Treatment encompasses prevention and lifetime integration for long-term successful outcomes. 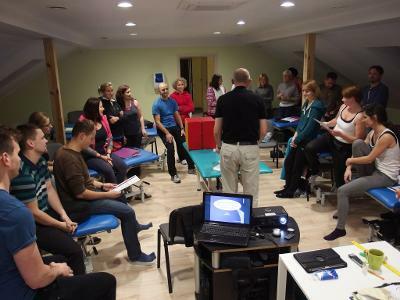 In November I have made another trip to Poland to teach Myokinematic Restoration as well to introduce Postural Respiration for first time in Europe, all together almost 70 professionals came. Because of enormity of material which respiratory course includes, I have decided to extend it to 3 days. I also made myself available for two extra online sessions to all who attended, so they do not feel "left out". All courses were taught in Polish which helped everybody to understand essence of PRI philosophy as related to mykokin and respiration. I have chosen my home town Opole, in Southern Poland as place of gathering. My audience however was from all different parts of the country. Consisting of physical therapists as well MD's and strength and conditioning individuals. While in Poland, I was invited to lecture at the professional meeting in small picturques town named Wisła. There, I met about 70 therapists, where I introduced four basic concepts of PRI pertinent to asymmetry, position, muscular chains and function of diaphragm on human function. I welcomed the opportunity to have one of the attendees from last weekend's PRI Integration for Baseball course write up a course review. 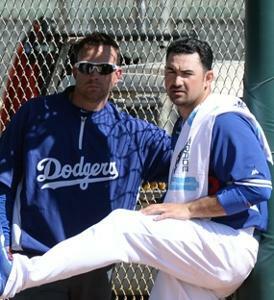 Steve Smith, Major League Physical Therapist for the LA Dodgers did a wonderful job summarizing the course in his review. Be sure to check out his write up, titled "Top 5 Reasons Why PRI Integration for Baseball Is As Good As It Gets." Check it out HERE! Consider joining the Postural Restoration Google Group! We welcome fellow PRI practitioners to join! The purpose of this group is to facilitate the exchange of PRI based concepts, ask advice about challenging cases, post important research articles, and create discussion regarding any PRI ideas or techniques that you care to share. The Google Group also runs a Book Club and is currently reading The Open Focus Brain by Les Fehmi. Discussion will begin January 12, 2015. Jason Masek, MSPT, ATC, CSCS, PRC will be presenting at the 2015 NSCA Coaches Conference in Louisville, KY later this week. The title of Jason's presentation is "Positional Influences, Breathing, and Performance: The Utilization of Postural Restoration for the Strength & Conditioning Specialist". Jason's presentation is on Friday, January 9th at 8:00am. If you are attending this conference, be sure to check out Jason's presentation! 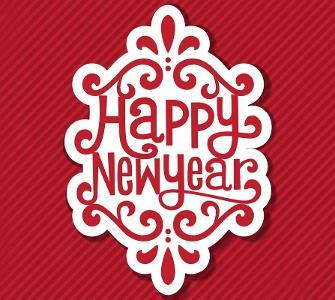 Happy New Year from PRI! 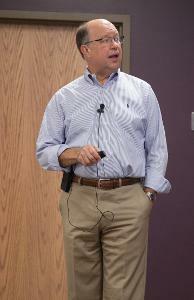 "I want to take this opportunity to thank every one of you who have attended a PRI course in the past. You are part of a family of people who are growing an Institute of passion and pride. Our board of directors, faculty and credentialed professionals have helped us grow from a total of 46 courses in 2010 to 85 courses scheduled in 2015. We now have over 150 national and international credentialed professionals! I am excited to now have a Director of Affiliate Courses and a Director of Faculty Development. I feel this will make it easier for future course attendees and PRI family to apply PRI conceptually and practically. In the last 5 years, we have more than doubled our annual course attendance and we have added four new affiliate courses. All of the courses continue to focus on multidisciplinary evidence and research, supporting asymmetrical concepts and integrative practice. Course attendance of the athletic trainers, strength coaches, chiropractors and dentists have also increase in the last few years and therefore, so have our credentialing programs. I truly feel blessed to work every day with the staff, directors and faculty who are family to me; and I am grateful for all of you who have or are considering becoming a part of this unique family and growing Institute." Our 2015 Brochure is also out you can check it out here.